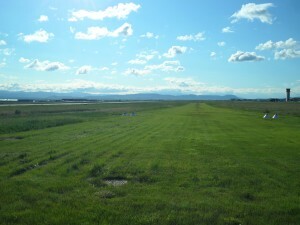 Runway 10/28 at the Helena Regional Airport is a turf runway 1,800 feet long by 75 feet wide. The strip is irrigated and mowed regularly during the summer months. Typically, RWY 10/28 is open from March through September, though that period of operation can be altered based on weather and Runway condition. Before utilizing RWY 10/28 check active Notice to Airmen (NOTAMs) for the Helena Regional Airport or call Airport Operations at 406-439-2821 for updated Runway condition.